Integrated Environmental Restoration Services, Inc. (IERS), in cooperation with Placer County Public Works, the California Tahoe Conservancy, the US Forest Service, the Tahoe Regional Planning Agency and others, designed and oversaw implementation of an urban erosion control project in King's Beach, CA that employed innovative, soil-based restoration techniques and quantitative monitoring of sediment source control effectiveness. IERS' role included providing project planning, restoration specifications, implementation oversight, and performance monitoring. All treatments were designed to control sediment at its source through increased soil hydrologic function, protection of surface soil and development of an appropriate, self-sustaining native plant community. The U.S. Forest Service funded two years of quantitative source control monitoring, which had not previously been conducted on a project of this type in the Lake Tahoe Basin. 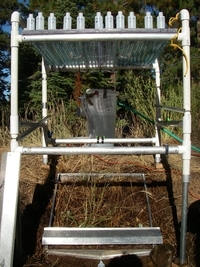 IERS used a range of monitoring techniques including vegetative and soil cover monitoring, soil density measurements, and simulated rainfall and runoff to directly measure whether restoration treatments resulted in improvements in soil function and sediment source control. IERS demonstrated that investment in soil-based restoration treatments resulted in sediment reductions that are an order of magnitude greater than hydroseeding treatments (without soil rehabilitation) and at least two orders of magnitude improvement over disturbed, bare soil conditions. 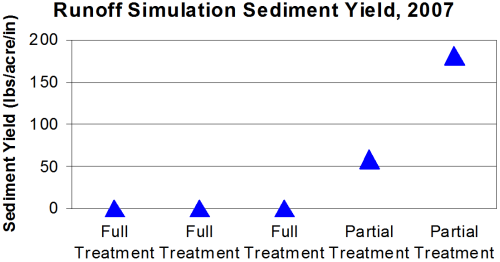 Vegetation cover, which is commonly used to determine project success, was shown to be an inadequate measure of sediment source control and therefore not reflective of overall project performance or achievement of project goals. The level of quantitative monitoring conducted as part of this project is critical if true adaptive management is to be applied and used to guide ongoing restoration efforts in the Tahoe Basin.